2015-06-09 - ANGLER EK - STILL ON A "CRYPTOWALL RAMPAGE"
Forgot to grab the payload from the infected host on the first run today, so I infected another host about 50 minutes later. The malware payload was different, with 196620 bytes from the first run and 200716 bytes from the second run. Both times, the Bitcoin address for ransom payment was 16Z6sidfLrfNoxJNu4qM5zhRttJEUD3XoB (the same address I documented back on 2015-05-26). 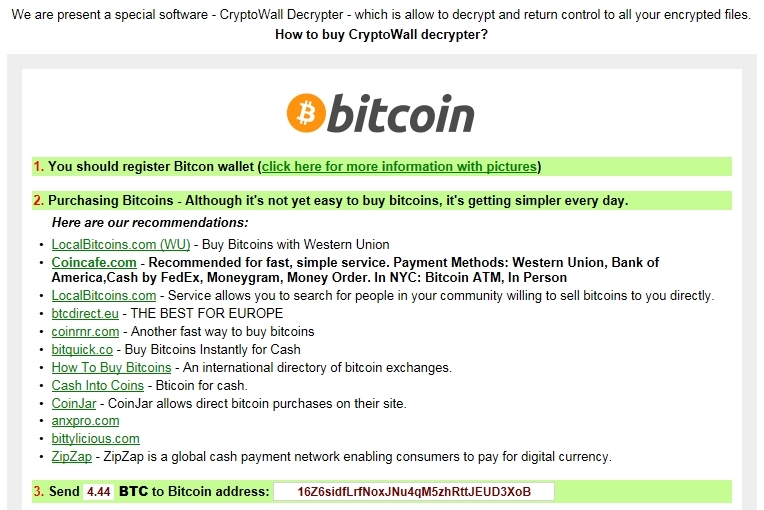 Started noticing CryptoWall 3.0 in Angler EK post-infection traffic as early as 2015-05-26. Since 2015-05-27, I've seen a lot of Angler EK sending CryptoWall 3.0 as the payload directly. (Here's a link to the SANS ISC diary about it). CryptoWall 3.0 isn't the only payload Angler EK is pushing, but it's the most common thing I've noticed from Angler since 2015-05-27. I suppose this is part of a large campaign from whoever's behind 16Z6sidfLrfNoxJNu4qM5zhRttJEUD3XoB.